Here is a new line of thought. The shape of the hollow relates to the outer form. I am planning a hole to pierce the hollow from above. I have been enjoying the stage like quality of the interior space. Perhaps because it is a hollow with no connection to the outside world it pulls you into a world apart; like a stage. I wonder if the hole above might drop down light and further encourage this feeling of looking into a little private world. This is how we unload blocks over 3 tons from a flatbed lorry. Probably not in the health and safety handbook but it gets the job done. My brilliant neighbours Nigel and Rich Colwill help with this tricky task. Thank you both. In this shot the lorry has gone and we are positioning the trailer before lowering the block down. This marble comes from Carrara in Italy. I bought it a year ago and have been waiting for an opportunity to bring it home.The block is now sitting in my yard waiting for inspiration. I have painted this ring three times to get it to this stage. I do this in order to ensure that the whole surface has been worked over at each grade of finishing. First the tarmac like 40 grit which is very aggressive and then more paint before working over the whole surface once more with a 60 grit. Finally the process is repeated with the 120. Small specks of paint remain here and there which will need a few hours to tidy up. This ring is made from the central section of a giant ring. The small block in the background is the centre of this one. I shall use that next. Tomorrow I receive a block from Italy which has been sitting in a yard out there for a year waiting to be brought home. With the clocks going back the working day ends in darkness. I quite like this as the sculpture takes on a different perspective under the glare of a halogen light. This piece is gradually taking shape and although the exact shape of the individual segments is not fully realised or even determined, I am certainly liking the way it is beginning to look. I started the day wrapping bailer twine around this ring to try and mark out the pattern. After much winding and unwinding of miles of string I gave up on the string and started to draw the lines freehand. This is very tricky and took me all day. Lots of scrubbing out of lines as they failed to meet the ones coming from the other side. Most frustrating but the pattern is on the marble and I have begun to etch out the lines with the disc. I am itching to see how the pattern will look. I have started a ring along the same lines as an earlier version but with the discs getting smaller and slighter as they rise. The evenings are drawing in and the photo taken at dusk is slightly dull as a result. I have been to London to visit my gallery which has joined forces with a gallery from South Africa called Everard Read. They are calling the new enterprise Circa. I hope this will be a happy union and generally feel very optimistic about it as Everard Read have been around for over a hundred years and have a great reputation and global reach. The date for my exhibition with them is now set for the beginning of April 2016. I have been diverted from marble for a time to try to erect a structure to help some clients visualise a possible sculpture. 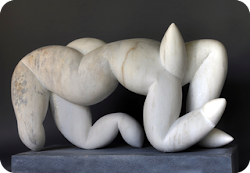 The proposed sculpture in marble is a twisting stacked form shape. The complete shape would be almost impossible to make in wood and so, after much cogitating, I have come up with a shorthand version. Hopefully this structure once installed in the clients landscape will give some idea as to how the proposed sculpture might look. I think that the scale and volume will certainly be made clear. The picture here shows the structure at night. I am projecting an image of the proposed carving onto the plywood. Only the right hand side could be transposed from the projection as the image distorted as you can see. The projector was precariously balanced on two tables on top of a neighbouring barn roof. It is funny stuff Onyx. I have never really felt at home carving it. For one thing it does not carve very nicely like a marble or a limestone. It behaves more like glass than stone. It rings like glass too, when you hit it. The other thing to understand about onyx is the translucence. Marble will let a little light into it but not like Onyx. This means that ( I am beginning to work out) the sculptural approach needs to be radically different in order to compensate for these changes in material. Up to now I have not felt I have had much success. I am trying a similar carving to the walking figure and trying to make the approach suit the material. The surface is rough at the moment so the translucence does not really show. I have completed the little figure. There is a gentle twist on the torso and hopefully looks as if she is striding along. There is so much to consider when carving a figure. I find myself tempted to get involved in detail but it can often undermine the whole. There are creative decisions to make constantly which makes it a quite different process from carving something abstract where the labour of removing stone can be technical rather than creative. Here I am back at the figure. I often carve a small torso when lost creatively. I think perhaps it is like a pianist practicing scales. I have carved dozens of such little torso’s and never tire of them as they remain an enigma for me; a puzzle I never manage to solve. Although nominally figurative I am only following an understanding I have built up and know that it is the belief that brings power rather than any closeness to the figure. Does the surface ring with conviction, or is it dead in parts? Here I have the figure walking, with the shoulders swinging one way and the hips the other. I do not suppose she will look like she is walking but something is added all the same. I put a pin up her leg this evening in order to stand her up. More work tomorrow, she looks very heavy at the moment. Many days spent cleaning up this piece. Although not quite there yet my poor fingers are worn pink and the nails on my thumbs flat on the inside. Slightly before time therefore I decided to put the sculpture on it’s base. The sculpture is on the floor so it is easier to drill and a hose is needed to keep the drill bit from getting too hot. I assembled the gantry over the sculpture as it is too heavy to lift by hand. I think I like this idea although I also feel it is time to move on into pastures new. This is the same idea as before but with a smaller hole in the middle. This will change quite a lot as the banding will vary in size to a much greater extent. You can see already the size on the outside. This is Italian marble from Carrara; much cooler visually than the Portuguese marble. Lots of chopping out tomorrow. When I eventually burst through from one side of the carving to the other I found the individual forms no longer looked very regular. I have been working and turning and working and turning all day. The amount of material removed has been gradually going down and the forms becoming slowly smoother and more regular. I don’t know if it will matter to anyone else but these little changes seem to make a great difference to the overall impact. I am following up an old line of interest. There was a carving a little while back with smooth forms in a ring. Here there are just three forms arranged in a triangle. I will break through between them as a hole is always a revelation. I initially thought of standing this carving on one of the forms but now think two might be better. One form might end up looking like Mickey Mouse as well as being top heavy. These patterns are really taking shape now. They are tending to be fairly large grooves as the marble chips off at any fine work where the grain is running in the wrong direction. I often find that the stone dictates the form to some extent. Here it seems to be saying that the hills must not be too proud. I am happy to listen and to flatten them a little. I am reminded of Van Gough’s night skies. The golden firmament seen from the outside rather than from within. I have forgotten how the pattern goes on these forms. It took me half an hour to work it out again. I thought that the swirls changed direction as they come off a hill and descend into a hollow but they do not. The pattern is just beginning to take shape here and will take a lot more working up next week. I am encouraged by what I see so far. I got the ball pretty round in the end. I cut out a form in plywood to scrape over the surface. With paint applied to the form it comes off on all the high spots. I don’t claim that it was perfect but as the only part of the present surface is the high tops of the hills it was not necessary to get the surface any nearer to perfection. I have marked out the rings that will go on to form the high and low mountains and valleys. I still cannot be sure this sculpture will be a success but am anxious to find out. I realised this morning that I have no clay that does not need lots of work to get it into a workable condition. I decided to try the idea out directly in marble. The first thing is to make a ball. Very difficult to do. As you can see I have made it round from two directions. Tomorrow I will work on the third dimension. I ended the day by gluing the pin that will hold the sculpture up once it is finished. This will be helpful whilst I am working on it too. The birth of something new does not look like much yet. I have had feedback that my maquette looking like a figure of eight on it’s side might be too imposing in the suggested position. This is tricky as I spend most of my time trying to make sculptures that have lots of impact and that are striking to the eye. Here it seems we need something more gentle with less immediate impact. I am thinking of a form broadly spherical. The outline produced will be more gentle than the ‘eyes’ that goggle from the previous idea. The surface idea I have is one borrowed from an old sculpture of mine involving conical hills and conical valleys. The nails you see here mark the tops of the conical hills. I will apply clay tomorrow. The wire is to try and stop the clay falling off. Pooch came and photographed the two new carvings. He also placed them in the proposed landscape on photoshop. I am delighted with the way they look and think they would be wonderful on a larger scale. I found this slab of Portuguese marble for the base. The surface is a natural fissure in the marble and there is some rust staining and a gentle undulation that works brilliantly with the carving. I have been working on a couple of small sculptures and here is the second of them. The idea is to make these sculptures on a small scale and to then place them in the landscape using Photoshop. In the landscape they will be shown full size at several meters long. If the client is interested we might then have the maquettes scanned and full sized models made in a foam of some sort. I have not done this before but it seems sensible and worthwhile if the client is at all unsure. This sculpture is a technical challenge as the area between the volumes is very tricky to reach and still requires considerable work. Marble from Portugal is a much nicer material to work than the exotic black marble of Tunisia. I am happy to be working it once more. The twisting forms are coming well but like all the others needs a good deal more finishing. The finishing will not only get rid of unsightly scratches but finalise the forms themselves to give them their crispness. I have been so enjoying the twist on the rings I have decided to employ the same twist on a simple vertical form. I thought of various alternative shapes. I was tempted to give the form some ‘belly’, but in the end withdrew from such a move towards figuration, opting instead for a form that simply gets a little more slender as it rises. We shall see if it is interesting or not. Sometimes the only way to be sure is to make a sculpture. There is always a gap between the imagined idea and the reality; the question is, how big a gap?The sculpture is standing vertically in the picture in order to drill the hole on top. I now have all my Portuguese marble in the yard. Nigel and Rich who farm next door helped me to unload the two last blocks. They are wonderful neighbours. Thank you both. Horrible to work though. Perhaps I am just used to working marble but this Tunisian black is no fun to work with. The dust it gives off is like talc; very slippery and smooth to the touch. I think there is something abrasive in there too however as sandpaper goes blunt very fast. Grumble grumble. The end result however might make it all worthwhile as it is beginning to look lovely. The picture makes it look almost complete but there are thousands of scratches to remove and hours of wet and dry work to do. My lorry load of marble arrived from Portugal today.We unloaded the two five ton blocks up at the farm and the remaining eight blocks with the telehandler. I managed to lift a block weighing 3.68 tons and to get it up into the field. The steering was very light but we made it. Brave machine! This has been rather a frustrating day. I have started to work this lovely block of marble. A marble I have never used before. As soon as I started to try and cut it however my blade went blunt. In horror I rang my friend Jonathan Loxley who bought a block at the same time and he was mystified by my problem saying that “it works quite well”. I put the block back in the field and went in for lunch, fed up. After lunch I went and visited my supplier of blades who told me that the blade was not ruined (phew) but ‘blinded’ or ‘clogged’ by the stone. He sold me a new blade which he told me would not clog. I made much better progress in the latter half of the day on a new ring. Although the marble here looks quite white, it actually polishes almost black with strong white veining. This is really taking shape and I am enjoying the forms here. They take shape quite fast but the endless delicate spaces in between will take days to get right. Today was cold; never getting much above freezing. A sprinkle of snow this morning had the children shrieking with joy. On going out to work I wrapped up well against the cold but as it was still, I soon warmed up and removed my heavy coat. I glued this ring on its base although there is quite a bit more to do on it. I want to see it standing so that I can get a proper look at it and perhaps think of the next ring. I think there might be several. This ring has lots of colour which does not show here as the surface is still rough. When cleaner the colour will shine through. In have turned my attention from huge sculptures for the landscape at Heligan to smaller more intimate works. I have to try to shed the disappointment of them deciding against the exhibition and work on, in a positive frame of mind. This new series will enable me to try out some ideas for carvings which might well work nicely on a larger scale at a later date. Everything fell out of the sky today. Hail and snow followed by fierce winds that made me look nervously behind me to the straw bale building as if I might see bales fly past in the gale. I made good progress with the ring and begin to think about different ways that they could configure. I like the form, it seems like a good canvas to work on. I am getting clogged up with marble here. I have spent the last few days drilling out the centre of this five ton block. I want to eventually make a ring form from it and will come back to it soon. In the meantime however I must get this block moved so that I can make way for a huge shipment that is due any day. As you can see, this block weighed 4.46 tons before the core was removed; too much for my machine! The marble is arriving from Portugal and will be unloaded with a Hiab on a lorry. There are a couple of blocks that will be immovable once they are put down and as such I am keen that they should be put in the right place. The exhibition at Heligan is on hold, and I must now turn my attention to smaller works instead of these large sculptures for the landscape.